A simple to make and popular evening snack, this mutton cutlet is best served with mint chutney or sauce of choice. 1. Add the minced mutton to a large bowl. 2. Add ginger garlic paste, turmeric powder, red chilli powder, coriander powder, green chillies, lime juice, coriander leaves and 2 tsp of oil. 3. Mix well and add salt as per taste. 4. Now add the mashed potatoes and mix well till it is firm. 5. Make balls of the mixture and shape them into medium sized cutlets. 6. Place the cutlets in the fridge for 20 to 30 minutes. 7. Heat a non-stick frying pan over medium flame. 8. Add 2 tsp of oil and 1 tsp of butter. 9. Swirl around to coat the pan evenly. 10. Dredge the cutlets in the breadcrumbs. Remove any excess crumbs and ensure it is coated properly. 11. Add the cutlets to the pan and fry till golden and crisp. 13. Transfer them to a serving plate. 14. Serve with chutney or sauce. 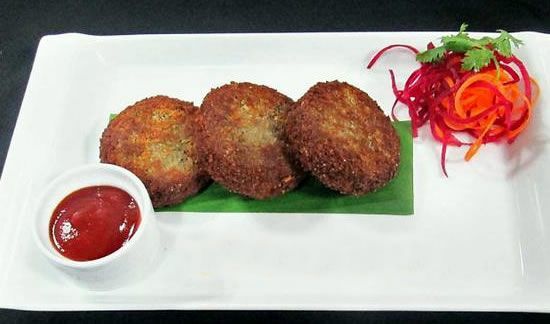 Feel free to comment or share your thoughts on this Mutton Cutlet Recipe from Awesome Cuisine.